Welcome to the AskNow® Psychic entertainment service (“Service”). The services provided are FOR ENTERTAINMENT ONLY. The services may not be used by users located in, or residing in, and location where use of the service if prohibited by either that jurisdiction or by the United States for residents of that jurisdiction. Acceptance of Agreement.This Agreement constitutes the entire agreement between AskNow® and users of AskNow® Services, and supersedes any and all prior or contemporaneous agreements, representations, warranties and understandings, whether written or oral. We may amend this Agreement from time to time, in our sole discretion, without specific notice to you. The most recent version of the Agreement will be posted on the Website. Your continued use of the AskNow® Service constitutes your acceptance of all of the terms and conditions contained within the Agreement effective at that time, as well as your acknowledgment of the reasonableness of these standards for notice of changes. 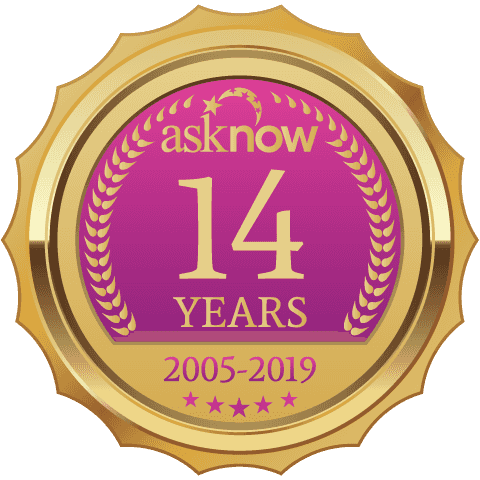 We encourage you visit asknow.com from time to time to review this Agreement for any updates or changes. Description of Services.AskNow® connects its registered users with psychic advisors (English or Spanish speakers) specializing in areas such as tarot, love and romance, career and goals, and numerology. Registered users can speak with psychic advisors via one-on-one online or mobile chat, through a callback to the registered user’s directed telephone or call number, or via a toll free number. In addition to the aforementioned Service, AskNow® also provides horoscopes, promotions and other services for registered users and non-registered users. The opinions expressed by psychic advisors are not necessarily those of AskNow®. Psychic advisors providing services via chat, the Website and/or telephone are independent contractors of third parties, and are neither employees of, nor supervised by, AskNow®. AS the advisors provide entertainment services, the advice should not be relied upon for medical, financial, legal, or psychological matters and psychic advisors are not substantial for such professionals. Registration & Your Account.To obtain an account and become a registered user of AskNow®, you must first either complete the registration form through the App, the Website, or contact an AskNow® representative via one of our toll free numbers, such as 1-800-2ASKNOW (1-800-660-1922). The information you must supply during the registration process includes: 1) full name; 2) billing address; 3) call back telephone number (i.e., the telephone number at which you desire to be contacted to speak with a psychic); 4) e-mail address; and 5) credit card information (collectively referred to as "Registration Data"). You agree to provide true, accurate, current and complete Registration Data. You must also select a User Name and password (or PIN if you register by telephone) that will be used to access your account information via the App, Website or via the telephone. You are responsible for updating, and agree to keep current, your account information as necessary. AskNow® will verify and approve all accounts in accordance with its standard verification procedures. For online registrations, once your registration is complete, a confirmation e-mail containing your User Name and password will be sent to the e-mail address provided, if any, during registration. You must keep your User Name and password confidential. AskNow® will not release passwords for any reason, other than to the registered user, except as may be specifically required by law or court order. You agree that you will not authorize and/or permit others to use your account. AskNow® is not responsible for unauthorized use of your account. Your account is non-transferable. You may continue to use your account so long as you remain a registered user in good standing. You agree that you are responsible to AskNow® for any and all charges resulting from the use of your account, even after your account is terminated. Pricing & Billing of Services.You agree to be bound by the pricing and billing practices of AskNow®. All charges are payable in United States Dollars. Currently, AskNow® provides for a single payment option; credit card (Visa, Mastercard, American Express, Discover). Payments to AskNow® may appear on your credit card statement as "Asknow.com" or as indicated during your use of the service. AskNow® reserves the right to change its pricing and/or billing practices at any time, in its sole discretion. All calls or chats to and/or from Psychic Advisors are billed at a per minute rate. The rate for each Psychic Advisor is posted on their psychic advisor listing and/or prior to or during the provision of the service. Except as provided below, the applicable rate for your call is the rate posted on the listing and/or disclosed during the call or chat session for that Psychic advisor at the time of your call or chat. The rates are subject to change and you are responsible for all charges incurred per call or chat session at the per minute rate of the psychic advisor as indicated at the time of your call. The charges for the call will be billed to the credit card provided by you during registration or such other credit card that you may have subsequently provided. Promotions and Introductory Offers.AskNow reserves the right to offer, from time to time, promotions or special offers and may limit promotional or special offers to first time or newly registered users. All offers are subject to change at any time and not all callers or online users may be offered all offers. Certain prior offers are grandfathered. Asknow has several classifications of psychic advisors including Top Rated, Elite and Master. Each psychic advisors profile indicates if they are top rated, elite or master. The promotional offers may have rates that differ for each of the classes of psychic advisors. The offers may be available at the time of registration to select new customers who register using a credit card. By joining AskNow® you may be offered the opportunity to purchase any one of several promotional packages of time that may only be used with a Top Rated Psychic Advisor. Please note that unused Top Rated Psychic minutes expire after one year. The three (3) minutes with an Elite and/or Master Psychic Advisor expire after thirty days if unused. First time registered users of AskNow’s Service may have the option of joining a Monthly Program at the time of registration. These offers are available at AskNow’s discretion and may be discontinued at any time. Enrolling in a Monthly Program results in a monthly recurring charge. It is automatically billed each month to the credit card provided by the registered user during registration. You may cancel your Monthly Program at any time by either logging in to your account at the Website, clicking on "My Account," selecting "My Club," and "Cancel Club," or through the setting’s screen on the App, by calling our toll free customer service telephone number. Cancellations will become effective upon the end of the current billing month. No credit will be given for partial months. AskNow® reserves the right to terminate your account if you do not utilize AskNow®'s services for a one-year period. ( You may only use your Monthly Program minutes with Top Rated Psychics). Except for the initial three (3) free minutes with an Elite and/or Master Psychic with purchase of a Top Rated Psychic package or monthly program (or, if available, one-time introductory offer of five (5) free minutes with an Elite and/or Master Psychic), the above PROMOTIONS, INTRODUCTORY OFFERS AND CLUB MINUTES MAY NOT BE USED TO SPEAK OR CHAT WITH A MASTER or ELITE PSYCHIC. As for ELITE and MASTER psychic advisors, special introductory offers may be available from time to time. Packages for top rated psychics may not be used with either master or elite psychics. All packages are subject to change at any time and may not be combined. Only one introductory offer per customer. As always, your time may be used via the telephone or one-on-one online chat. (Chat is not currently available through the App). After your initial package minutes have been used, you will hear a tone and prompt (chat customers will see an on-screen prompt) and will have the option to continue your call or chat at the Elite or Master Psychic Advisors per minute rate, or you can end the call, thus avoiding additional charges by hanging up. Conduct.In order to continue to enjoy the privileges of being an AskNow® registered user, you must follow the guidelines set forth in this Agreement. As a registered user, you agree that you will not: 1) attempt to obtain the personal contact information of a psychic; 2) divulge your personal contact or financial account information to a psychic and request to be contacted directly; 3) use vulgar, harassing, obscene, privacy invading, or defamatory language during a psychic reading or in a psychic rating; 4) do anything to disrupt the operation of the AskNow® App, website, services or network; 5) attempt to gain unauthorized access of the network to transmit "junk mail" or other mass mailings; 6) advertise or market any services or products; 7) post, upload or transmit false or misleading information or take any action that violates the rights of third parties; 8) record, stream, or store your call or chat with a pcychic advisor or customer service. (You understand and agree that AskNow may record the chat or call. If recorded, AskNow may delete it at any time) or 9) make false statements or attempt to use financial or other information that you are not authorized to use. The above items are not intended to be an all-encompassing comprehensive list. At all times, AskNow reserves the right to revoke any member’s registration for conduct it deems harmful, offensive or merely inappropriate. Your psychic rating shall be accurate and may be posted and/or edited, in our sole discretion, and should not contain vulgar or defamatory language. Additionally, as a condition of your use of the Service, you represent and warrant to AskNow® that you will not use the Service for any purpose that is unlawful or prohibited by the applicable terms, conditions notices of this Agreement. You may not use the Website, App or telephone system in any manner that could damage, disable, overburden or impair the Service or interfere with any other party's use and enjoyment of the Service. You may not attempt to obtain any materials or information through any means not intentionally made available or provided for through AskNow®. Termination & Cancellation.You agree that AskNow®, in its sole discretion, may terminate this Agreement and/or suspend your account (or any part thereof) at any time, without notice to you, in the event that AskNow®: 1) reasonably believes that you are in breach of the Agreement; 2) reasonably believes that you have provided incomplete, inaccurate or untrue Registration Data; 3) decides to discontinue offering the service. You may cancel your account at any time. Upon cancellation, your membership to use; or (4) any conduct AskNow in its sole discretion to be improper; or (5) without reason. AskNow® services, as set forth herein shall immediately terminate. If AskNow® terminates this Agreement, or suspends your account for any of the reasons set forth in this Agreement, AskNow® shall have no liability or responsibility to you, and AskNow® will not refund any amounts previously paid and you forfeit all unused pre-paid minutes that may remain in your account. You understand and agree that cancellation of your account is your sole right and remedy with respect to any dispute with AskNow®. License Grant.As a user of the service, you are granted a non-exclusive, nontransferable, revocable and limited license to access and use the Service in accordance with this Agreement. AskNow® may terminate this license at any time for any or no reason whatsoever. You may use the Services for your own personal, non-commercial use. No part of the Services may be reproduced in any form or incorporated into any information retrieval system, electronic or mechanical. You may not use, copy, emulate, clone, rent, lease, sell, modify, decompile, disassemble, reverse engineer or transfer the Services, content or any portion thereof. You may not use any device, software or routine to interfere or attempt to interfere with the proper working of the Services. AskNow reserves any rights not explicitly granted in this Agreement. Proprietary Rights.The content, organization, graphics, design, compilation, magnetic translation, digital conversion, software and other matters related to the App, Website and/or Service are protected under applicable copyrights, trademarks and other proprietary (including, without limitation, intellectual property) rights. The copying, redistribution or publication by you of any part of the Website, App or service is strictly prohibited. You do not acquire ownership rights to any content, document, software, services or other materials viewed at or through the service. The posting of information or material on the App or at the Website by AskNow® does not constitute a waiver of any right in such information and/or materials. Third Party Websites.The Service, App, Website, advertisements and/or third parties may provide links to other Internet website’s content, and/or resources. AskNow® is not responsible for the content, terms and conditions and/or privacy policies on such third party Apps, services, or content. If you choose to link to content not controlled by AskNow®, AskNow® makes no warranties, either express or implied, concerning the content of such service, including the accuracy, completeness, reliability or suitability thereof for any particular purpose, nor does AskNow® warrant that such service or content is free from any claims of copyright, trademark or other infringement or the rights of third parties or that such website or content is free from viruses or other contamination. CARRIER TRANSACTIONS AND CHARGES.Your dealings with any wireless, telecommunications, app store, or other carrier ("Carrier") in connection with accessing the App or the Service, including payment for usage charges and delivery of any Software, participation in any promotions offered by any Carrier, and/or any other terms, conditions, warranties or representations associated with such dealings or promotions, are solely between you and the Carrier. AskNow shall not be responsible or liable for any part of any such dealings or promotions. NOTICES AND ANNOUNCEMENTS.By opting in to use our Service including receipt of email, push notifications, text messages, phone calls, free trials, promotions and/or special offers, you authorize us to notify you of information that AskNow deems is of potential interest to you. Notices and announcements may include commercial text messages, emails, push notifications and other notices describing changes, upgrades, new products and services. You may unsubscribe or change your communication preference by accessing your account through the website, visiting the settings screen within the App, following the unsubscribe link or instructions within the communication, or calling customer service. DISCLOSURE AND OTHER COMMUNICATION.We reserve the right to send you messages through email, text messages, push notifications, telephone or otherwise concerning the Service for the purpose of informing you of issues, changes or additions to the Service, or of any AskNow related products and services. We reserve the right to disclose information about your usage of the Service and demographics in forms that do not reveal your personal identity. By your use of the Service, you consent to such disclosures and communications subject to the terms of our Privacy Statement. Indemnification.You agree to indemnify, defend and hold harmless, AskNow® and its parents and subsidiaries, and each of their respective officers, partners, members, managers, employees, agents and attorneys, against any and all liabilities, claims, actions, suits, proceedings, judgments, fines, damages, costs, losses and expenses (including settlement costs and/or reasonable attorneys' fees) arising from or relating to your use of Services, and any material that you submit to or transmit through the Service, your violation of this Agreement, your infringement or violation of the rights of another, or termination of your access to the Services. Disclaimer of Warranties.THE SERVICES IS PROVIDED ON AN "AS IS" AND "AS AVAILABLE" BASIS, AND ALL WARRANTIES, EITHER EXPRESS OR IMPLIED, ARE DISCLAIMED TO THE FULLEST EXTENT PERMISSIBLE PURSUANT TO APPLICABLE LAW (INCLUDING, BUT NOT LIMITED TO, THE DISCLAIMER OF ANY WARRANTY OF MERCHANTABILITY, NONINFRINGEMENT OF INTELLECTUAL PROPERTY AND/OR FITNESS FOR A PARTICULAR PURPOSE). IN PARTICULAR, BUT NOT AS A LIMITATION THEREOF, ASKNOW® MAKES NO WARRANTY THAT: 1) THE SERVICES WILL MEET YOUR REQUIREMENTS; 2) THE SERVICES WILL BE UNINTERRUPTED, TIMELY, SECURE OR ERROR-FREE; AND 3) THE RESULTS THAT MAY BE OBTAINED FROM THE USE OF THE SERVICES, INCLUDING PSYCHIC ADVISORS OR HOROSCOPES, WILL BE ACCURATE OR RELIABLE. THE SERVICES MAY CONTAIN BUGS, ERRORS, PROBLEMS OR OTHER LIMITATIONS. ASKNOW® WILL NOT BE LIABLE FOR THE AVAILABILITY OF THE UNDERLYING INTERNET OR TELEPHONE CONNECTION AND/OR ANY AND ALL SERVICES. ASKNOW® ASSUMES NO RESPONSIBILITY FOR THE DELETION OR FAILURE TO STORE ANY MESSAGES OR PERSONALIZED SETTINGS. NO ADVICE, WHETHER WRITTEN OR ORAL, OBTAINED FROM ASKNOW OR THROUGH USE OF THE SERVICES, SHALL CREATE ANY WARRANTY NOT EXPRESSLY STATED IN THIS AGREEMENT. Send written feedback tocustomerservice@asknow.comas to why your experience was unsatisfactory. Please provide as much information as possible including the advisor's name and time of the call. Please provide this information within 72 hours as it is our position that the sooner we can address this problem the better the service we can provide our customers. You can also call customer service at 800-227-5669 and provide our friendly agents with the detail described above. Once we receive your detailed information we will, in our sole discretion, either: a) refund your credit card charges for that call by the amount you paid up to a maximum of the cost of the initial ten minutes of your call or online chat; or, b) credit your Member account with up to five (5) complimentary minutes so that you can try another Psychic Advisor. In order for us to credit your account, you must have a registered credit card on file with Asknow®. The Satisfaction Guarantee contained herein is applicable only to New Members first call with a Psychic. Limitation of Liability.YOU AGREE THAT ASKNOW® AND ITS PARENTS AND SUBSIDIARIES, AND EACH OF THEIR RESPECTIVE OFFICERS, PARTNERS, MEMBERS, MANAGERS, EMPLOYEES, AGENTS AND ATTORNEYS SHALL NOT BE LIABLE FOR ANY DIRECT, INDIRECT, INCIDENTAL, SPECIAL, CONSEQUENTIAL OR EXEMPLARY DAMAGES RESULTING FROM THE USE OR INABILITY TO USE, OR THE INTERRUPTION, SUSPENSION OR TERMINATION OF, THE SERVICE, EVEN IF ASKNOW® AND ITS PARENTS AND SUBSIDIARIES, AND EACH OF THEIR RESPECTIVE OFFICERS, PARTNERS, MEMBERS, MANAGERS, EMPLOYEES, AGENTS AND ATTORNEYS HAVE BEEN ADVISED OF THE POSSIBILITY OF SUCH DAMAGES. SOME JURISDICTIONS DO NOT PERMIT THE EXCLUSION OF LIMITATION OF LIABILITY FOR CONSEQUENTIAL DAMAGES; IN SUCH STATES, LIABILITY IS LIMITED TO THE FULLEST EXTENT PERMISSIBLE BY LAW. Arbitration Choice of Law & Venue.This Agreement shall be construed in accordance with and governed by the laws of the State of Florida. Any and all disputes arising out of this Agreement or the Services referenced herein shall be resolved by binding arbitration under the auspices of, and pursuant to the Consumer Arbitration Rules of, JAMS before a single arbitrator to be held in such location is set by the Arbitrator. The Arbitrator shall not have any authority to arbitrate claims on a class or representation basis or to award punitive damages. We each expressly agree that the arbitration shall be only for your personal claims and that we each waive any right to file or participate in a class action or other representation basis. The arbitration will allow the exchange of non-privileged information relevant to the dispute. Legal Warning.Any attempt by any individual, whether or not an AskNow® user, to damage, destroy, tamper with, vandalize and/or otherwise interfere with the operation of the Service, is a violation of criminal and civil law and AskNow may elect to pursue any and all remedies against any offending individual or entity to the fullest extent permissible by law and in equity. Customer Service.You may contact AskNow® customer service via e-mail at CustomerService@AskNow.com, by 1-800-660-1922.